This Danish Fashion Jewelry Display Case Anti-Theft might be a double-edged sword as merchandising display. One must assume the duality of presentation but limited access is a logical tradeoff. The FixturesCloseUp focus is the metal Danish Display, with refined spindle legs, and anti-theft security courtesy of a basic padlock. 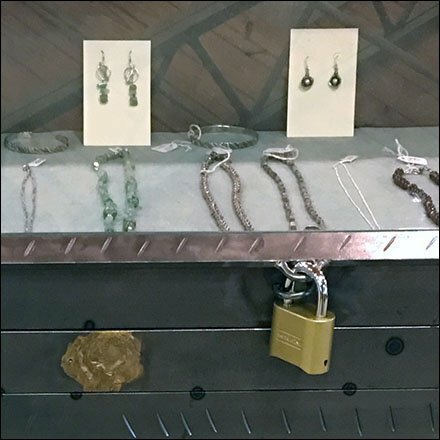 Consider this Danish Fashion Jewelry Display Case Anti-Theft in the gallery of images. Seen at Dane Decor, Downtingtown, Pennsylvania.